Eden Hazard says it is "not a problem" if a move to Real Madrid fails to materialise as he would be happy to finish his career at Chelsea. The 27-year-old Belgium playmaker has spoken of his daily quandary over his future, whether to extend his Chelsea contract which expires in June 2020, or seek a "dream" move to Real. 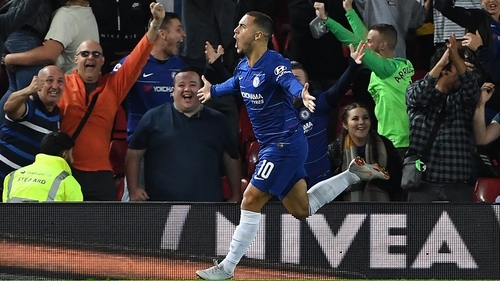 "I can finish with Chelsea," Hazard told Sky Sports ahead of the weekend meeting with Manchester United. "No problem at all. I am very happy with this club, with the team, my family is happy here. "So If I don't go to Spain, it is not a problem. I love the fans - I think the fans love me. What happens in the future, I will be happy, so that's it." Hazard joined Chelsea from Lille in June 2012 and signed his current contract in February 2015. He has appeared to rule out a January switch to Madrid in one of many public pronouncements on the situation in the October international break, comments which were perhaps designed to gauge whether Real's reported interest is genuine. If no contract extension is agreed by the end of this season, Chelsea could risk Hazard leaving on a free transfer the following summer so could look to cash in on him. Get all the team news from around the grounds with Saturday Sport Extra - live on the RTÉ Sport Facebook page, the RTÉ Player and RTÉ News Now from 2pm.